Another week of Project Life 2012 in the books. Looking back, this week was a recent favorite of mine. 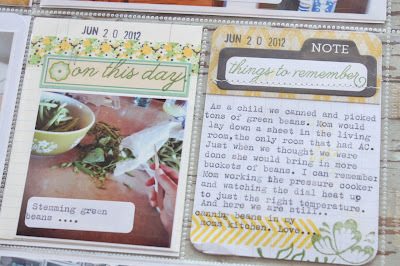 I like that there is lots of clean, white space, handmade journaling cards, stamping, lots of typed journaling and meaningful photos. The stories are all coming together day by day, week by week. Still loving this project. 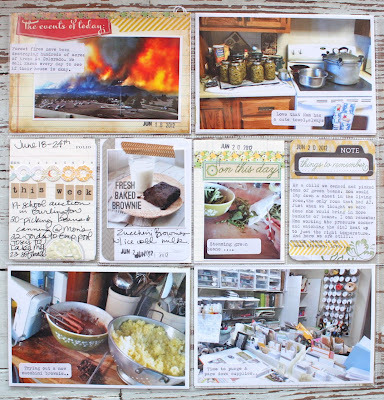 This week was was full of Summer cooking and canning, softball tournaments (an insert will be added), swimming, pretty flowers and the looming fires of Colorado. 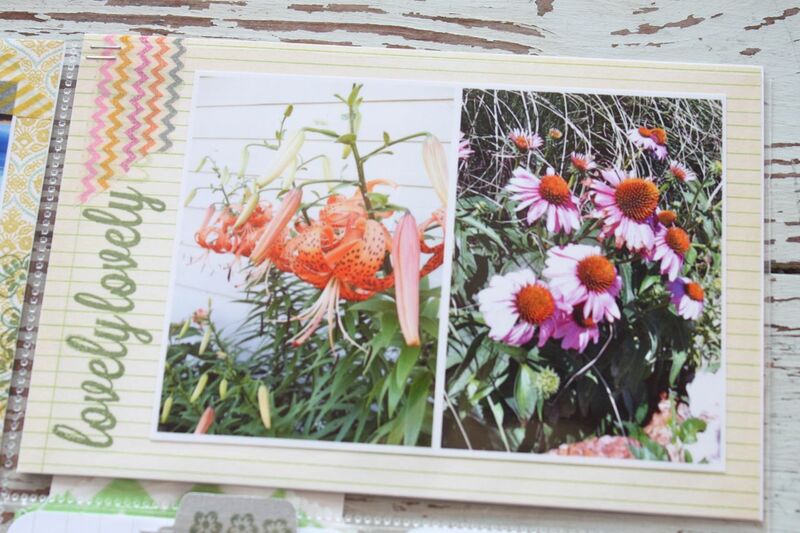 I love that this week I was able to easily choose from a stack of handmade journaling cards. I've decided to add any stamping to the cards during the actual assembly of a particular week. 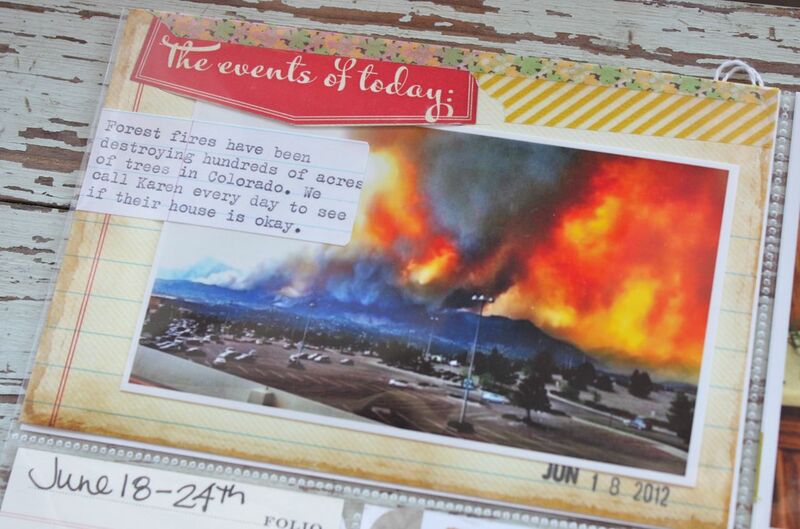 I never know how much journaling or what type of photo I will add to a journaling card so I like to leave them fairly blank. The Colorado fires were a big deal to our family. My sister has a home up in the mountains and we kept in constant contact about evacuations of friends and family and how close the fires were to their homes. No damage was done to my sister's or any of her friends' homes. What a scary week it was. This photo below takes me right back to that week. 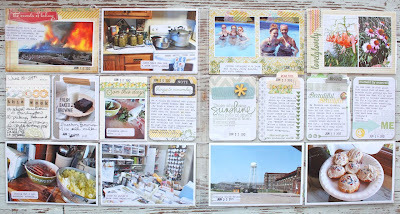 The 4 x 6 insert below is from Elle's Studio. 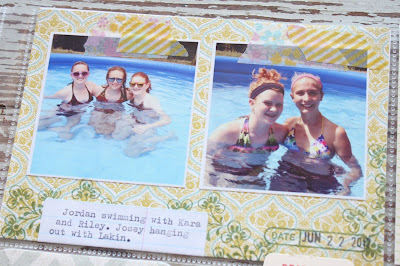 More swimming with friends. I actually used these photos for the prior week too and forgot that I did that. But I just rolled with it and left them in this week's layouts too. Stamps and yellow and floral Washi tape are from My Mind's Eye. 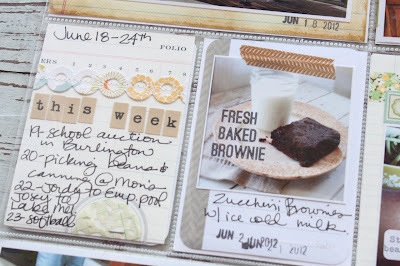 I used Notebook Paper Labels for lots of my journaling this week. Some of the few flowers that I had in the flower beds before the extreme heat just wilted all of them. So glad I got these few photos.....and a good reminder to not wait to take a photo. The opportunity may pass quickly. Washi tape is from My Mind's Eye and stamps are from Studio Calico. My Week in Review card plus a photo with some Washi tape. 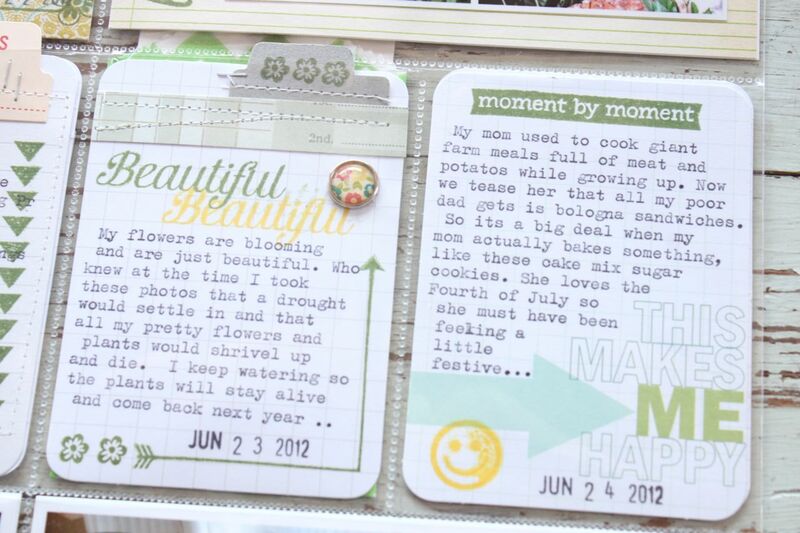 More handmade journaling cards. 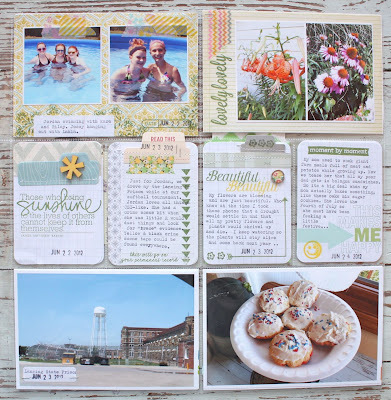 Washi tape is Freckled Fawn, flower stamp, chevron and sentiments are from My Mind's Eye. 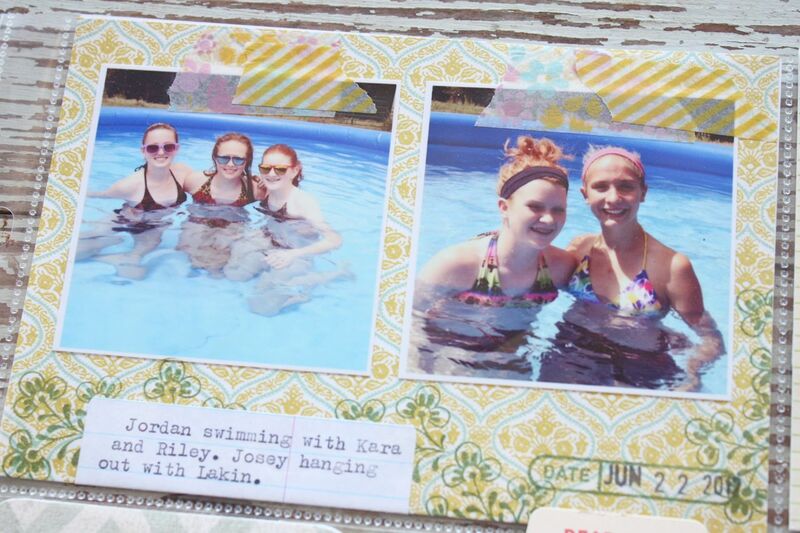 What I love about Project Life is that in 2 small 3 x 4 sections I can have a photo and tell an event from the past that I was reminded of. The past, the present....it all works so well together. 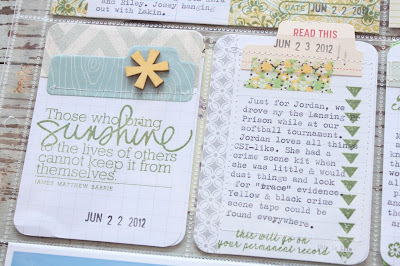 Here's another story that I typed up about Jordan and her love of all things CSI and crime related. Another recent photo that sparked a memory from the past. Sunshine stamp is from Technique Tuesday (Ali Edwards design), wood veneer and stamps are from Studio Calico, tab is from October Afternoon and Washi tape is Freckled Fawn. Lots of Studio Calico and My Mind's Eye stamps on these pre-made journaling cards. 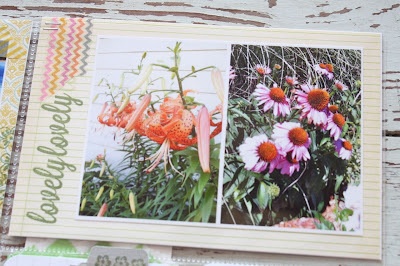 I mixed the Project Life cards with my own embellishments for a mixy matchy look. But the journaling is still front and center. Brad is from October Afternoon. And yet a 3rd story this week that sparked an old memory. This time the photo of the plate of cookies brought back a memory of the days my mom cooked a lot for my family....but not so much now. A great week from our life. I'm so happy that I captured it. Even though I'm several weeks behind, it's so nice to be able to get the memories and the stories down while my old brain can still remember them. Long gone are the days of sifting through old photos and trying to recall the event. 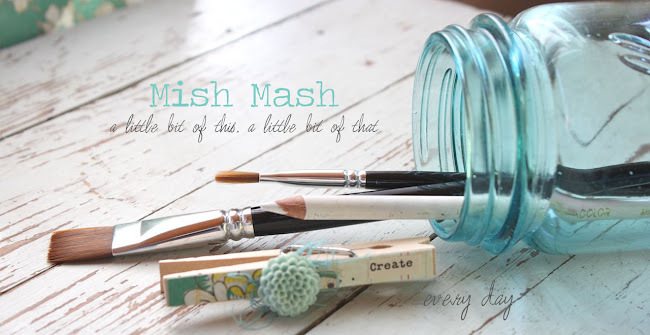 Project Life helps me get it all down in a timely manner and I love that! 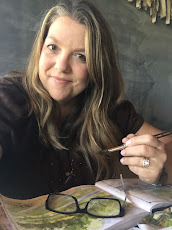 Is Project Life for you?